In April 2014, the article was published in the Journal of Medicinal Chemistry Communications. It is titled “The synthesis and functional evaluation of a mitochondria-targeted hydrogen sulfide donor, (10-oxo-10-(4-(3-thioxo-3H-1,2-dithiol-5-yl) phenoxy)decyl) triphe nylphosphonium bromide (AP39)”. The popular media coverage of this study will later know it as the “farts cure cancer study”, though the study had nothing to do with curing cancer or flatulence. The press release about this study was published in July 2014 on the website of the University of Exeter, with a slightly more catchy title: “Rotten egg gas holds key to healthcare therapies”. On July 11, 2014, Time Magazine was the first popular media publication that picked up the story. I was able to access the original Time Magazine article via Archive.org, also known as The Way Back Machine, a digital archive of the Internet. 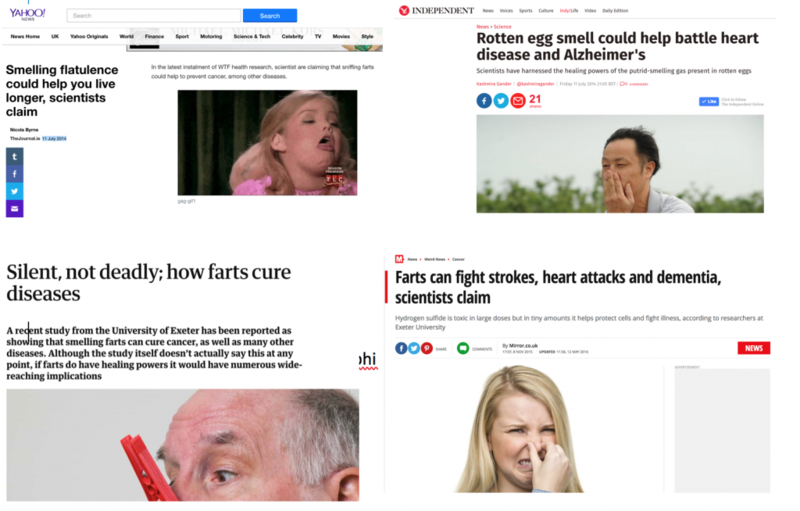 This article first introduced a unique and interesting interpretation of the scientific findings; the title of the article was, surprisingly, “Scientists say smelling farts might prevent cancer”. On July 18th, just one week after the original publication, the article was completely rewritten, changing the title to something more like what we’d expect from Time Magazine, “A stinky compound may protect against cell damage, study finds”, as well as adding a correction notice at the bottom of the page. Once Time Magazine introduced these specific elements to the story (cancer and farts), neither of which is mentioned in the original paper or the press release, the rest of the popular media outlets picked up on the story and it went viral that week, as can be seen by the sheer amount and speed of publication of blog-style stories with a variety of funny pictures and puns all over the Internet. In order to illustrate the spread of the story, I searched for articles published between July 1 and July 31, 2014 by searching keywords “farts”, “cancer” and “study” in the Google search engine. I chose Google, because traditional academic databases do not compile many blog and online news sites, and what I really wanted to see is the immediate spread of the story online, without filtering by reliability or popularity of the website sources. My initial Google search provided 1,260 search results. As a pilot study within severe time constraints, I decided to choose the first 17 unique blog-style articles to analyze (the first two pages of Google search results). 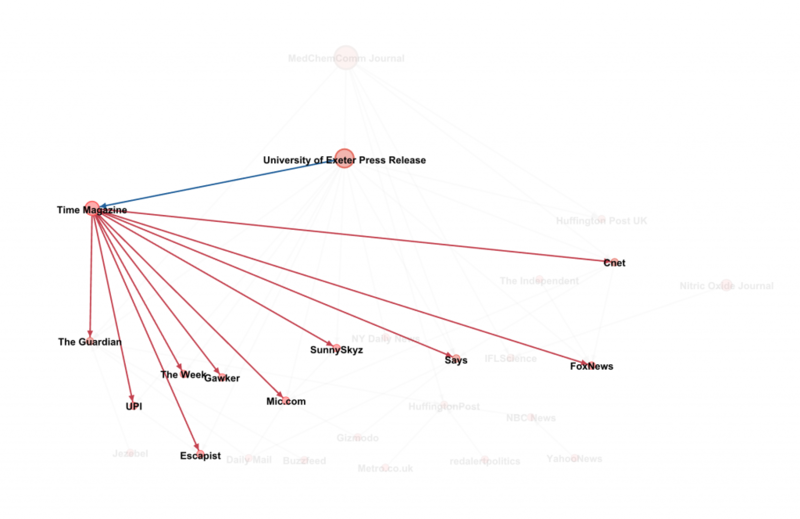 Below is the visualization I built that shows how the story spread across a variety of blog and news platforms during the month of July 2014. This was created using Gephi, a network visualization software. In this visualization, the nodes represent individual articles, with their sources noted, and the edges (arrows) represent the spread of information via explicit hyperlink citation. For example, the Huffington Post UK article hyperlink cited two sources: the original article and the press release. 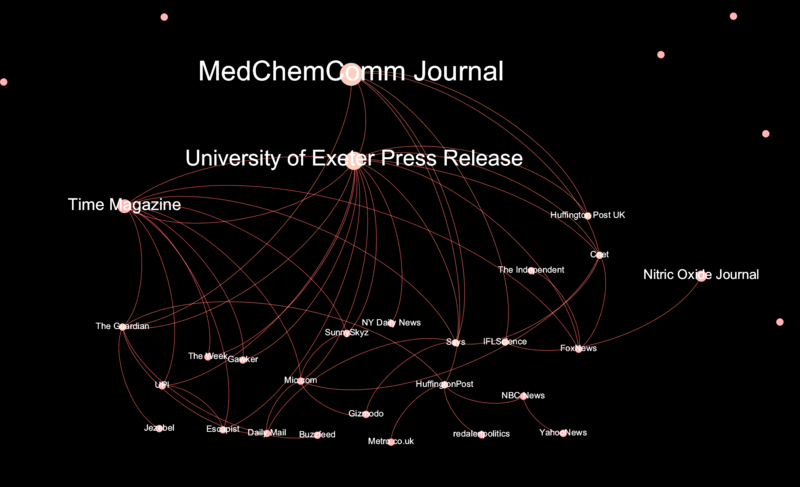 After extracting the date and time of publication, publication name and the list of all hyperlinked citations mentioned in each of the first 17 articles, I created the network visualization of how the story spread using Gephi and then started to isolate how often the original publication was used as a source, as opposed to secondary information, especially the press release and the rewritten Time Magazine article. Just from these visualizations, we can see that popular media publications over-reliance on secondary sources, as opposed to the original scientific publication. When adding the temporal parameters of these publications, we also find out that the references to the Time Magazine were made prior to the article being completely rewritten on July 18th. This is by far the most interesting and disturbing finding. This means that the citations as they stand now in all those articles are actually referencing information that no longer exists, as the URL of the Time Magazine article remained the same, while the title and the entire contents of the publication were completely changed. 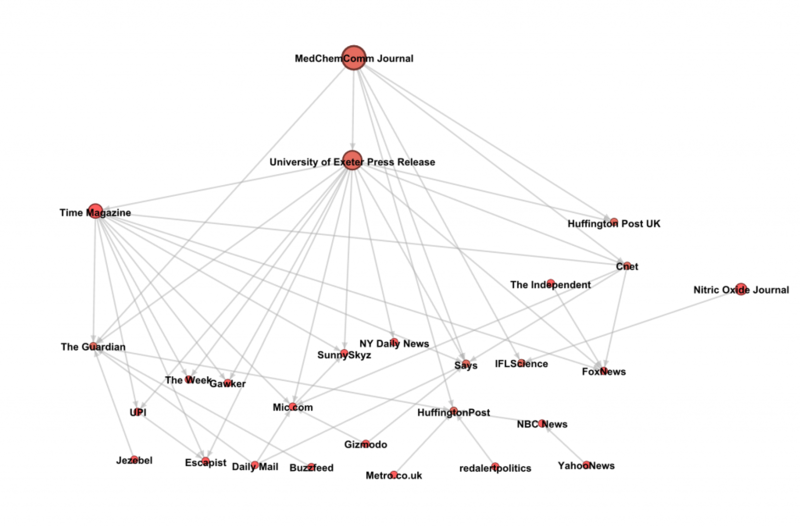 First, the popular media publications refer to each other as sources of information, creating a type of echo-chamber. This may be because of the need for transparency as a professional norm in journalism, but it can also signal a need to transfer responsibility and accountability of fact checking ones sources prior to publication, e.g. “We are not saying this, the DailyMail said this and we are telling you what they said”. Another obvious theme is the lack of reliance on the original sources, possibly due to the de-professionalization of science journalism and overuse of amateur, freelance writers coupled with the need to publish high quantity with high speed, little emphasis on quality or depth. This needs more exploring in future research. A final fascinating theme is the constantly changing online content. The fact that the initial spark of confusion in this pilot study, the Time Magazine article, was able to avoid any responsibility by simply appending a correction notice after the rewrite. This constantly changing online environment is not something the general public is aware of, but it is a common practice in the current media age. This complicates the network structure significantly, since, as mentioned prior, later citations of other popular media publications end up referencing information that no longer exists.